To anybody following the news over the last few months, it should be clear that sexual harassment and sexual abuse are rampant in our society. It’s not just limited to Hollywood or government. It’s part of the culture we live in. It can poison an institution. It can poison a workplace. And it can poison a family. Cinefamily fell into all three categories. For years it was a key part of LA’s film scene and its cultural scene. It was a place where employees and volunteers worked long hours, knocking themselves out to deliver a diverse and innovative film program. And for the loyal audience it built, people who were passionately devoted to movies, it truly seemed ike a family. It wasn’t just about watching movies. A lot of people felt a deep connection to Cinefamily. In August the news broke that members of Cinefamily’s leadership had been accused of sexual harrassment and sexual abuse. The LA Weekly and BuzzFeed News both interviewed former employees, many of whom described a toxic environment at Cinefamily and alleged that they had either been victims of or had witnessed various kinds of harrassment and assault. The two men who were the focus of the accusations resigned. After a couple months of uncertainty about whether Cinefamily could survive the scandal, the board released a statement saying that Cinefamly was shutting down. It makes sense. It’s hard to see how Cinefamily could go on. But it’s a huge loss to the local film scene. Revival theatres and art houses have become scarce in LA. Competition from on-line media makes it easier to watch movies pretty much anywhere and any time you want. But even though new avenues for distribution have opened up in recent years, most movies were meant to be seen on a big screen and with an audience. It’s a shared experience. Even if you’re by yourself in a roomful of strangers. In fact, sometimes the fact that you’re sitting in a darkened auditorium, just one more stranger in the faceless crowd, makes the experience even more powerful. There are times when the audience reacts as one, when the movie you’re watching brings you together and makes you realize that there are basic feelings we all share. A while ago I went down to the venue that Cinefamily called home, The Silent Movie Theatre on Fairfax. I wanted to take some pictures. It was sad seeing the place all closed up. But this isn’t the first time I’ve seen it go dark…. It started out in 1942 as the Old Time Movie Theatre. Though sound films had become the standard in Hollywood only a little over a decade before, silent films were already largely forgotten. But John and Dorothy Hampton kept Griffith and Chaplin, Pickford and Gish alive by screening their movies at the little theatre on Fairfax for 37 years. John was passionately devoted to the silents, and in addition to screening them he worked hard at restoring the prints in the collection he and his wife built. Unfortunately, John fell ill and the theatre closed in 1979. The Hamptons still lived upstairs during the following years, but the theatre was dark and truly silent. John died in 1990. Photos of silent film stars on display in front of the theatre. The theatre reopened in 1991, thanks largely to the efforts of Lawrence Austin. Apparently he had become acquainted with the Hamptons some time before, and together with Dorothy he brought the theatre back to life. Now called the Silent Movie Theatre, it offered pretty much the same programming as it had when John Hampton was alive, and it garnered a whole new audience. During the years that Austin ran the place he acted as MC, promenading down the aisle before every show as the accompanist who provided music for the screenings performed a playful march. (I remember Hail to the Chief, but other sources say it was Pomp and Circumstance. Both could be correct.) The elderly Austin always dressed formally, always held himself erect. You could see he took pride in presenting these films, and he introduced them to the audience as though the movies were old friends. Regular patrons grew to love him. For a while Dorothy continued working at the theatre, but suffering from Alzheimer’s, she eventually moved to a care facility. Austin had turned the theatre into a successful business, and at some point she turned ownership of the building over to him. Then one night in 1997, while a movie was playing in the theatre, Austin was shot during what appeared to be a robbery. In reality it was a paid hit, financed by Austin’s partner, James Van Sickle, who was apparently named in the old man’s will. Investigators looking into the crime uncovered much more than anybody wanted to know. Both Austin and Van Sickle had criminal records. Dorothy Hampton’s family accused Austin of having stolen the theatre from her. It was an awful, depressing mess. Those of us who were mourning the closing of the Silent Movie didn’t want to hear the charges levelled against our old friend. It was bad enough to lose the theatre. Now it was as though our memories of it were being stolen. Dan and Sammy Harkham bought the theatre in 2006, and this was the beginning of Cinefamily. Moving away from silent movies, the theatre began to show an amazingly eclectic mix of films under the leadership of Hadrian Belove. The programming ran from incredibly obscure oddities to crowd pleasing popular hits. I remember among the films I saw there were Film Socialisme and Breaking Away. I wasn’t a regular at Cinefamily, but I remember that when I did go there was a sense of cameraderie about the place. The employees, the members of the audience, all seemed happy to be there. That’s all over now. As a result of allegations made by former employees and volunteers, Belove and board member Shadie Elnashai resigned in August. In November the board announced that Cinefamily was closing down. The loss of the theatre is terrible. The loss of trust is even worse. In situations like this people often ask how it could have gone on for so long without coming to light. The answer is that none of us want to believe it. Movies can be lots of different things, but for many of us who love the medium, a large part of the attraction is the escape into a fantasy world. While we’re sitting in the darkened theatre we can be transported to a place where the cruel realities of the real world fade away. A classic Hollywood romance can make us believe that love conquers all. A sci-fi flick may take us to worlds we never imagined. Even a horror film can satisfy our need to believe in justice by showing how the wicked are always punished in the end. But Hollywood is about manufacturing fantasies. And for as long as Hollywood has existed, there have been guys like Harvey Weinstein. It’s brutally difficult to acknowledge that the industry which has done so much to shape our culture has a long history of protecting sexual predators. But it’s true of Hollywood. It’s true of Washington. It’s true of Wall Street. And you can find the same dynamic at play in churches, in museums, in schools, and in our families. We don’t see it because we don’t want to. Which is why it keeps happening over and over again. And so another family has been torn apart. The little building on Fairfax is dark again. And LA has lost much more than a place to see movies. In the twenties, Charlie Chaplin was sitting on top of the world. An international star and owner of his own studio, he had complete control over the films he made. Chaplin worked at his own pace, taking as much time as he needed to get things right. He might spend days on a single scene, and if later he decided it wasn’t right, he’d go back and shoot it all over again. If he felt like he needed a break in the middle of shooting, he’d shut the production down and go back to it when he was ready to resume. I can’t think of another commercial filmmaker who had the same freedom. Chaplin started out making shorts in the teens. His early efforts were rough, but by 1920 he’d mastered the medium, and it’s important to understand what the medium was in those days. In the silent era, commercial filmmaking relied on characters that were easily recognizable stereotypes, and stories that were told in the clearest possible terms. Without dialogue to help define more complex characters and situations, filmmakers had to use a visual language that was simple and direct. When Chaplin came on screen as the Tramp, audiences recognized the character immediately. He was the little guy, the ordinary fellow who didn’t want any trouble, and spent most of his time just trying to get by. Put him next to a burly roughneck or an elegant society woman and the situation was clear right away. Without a word being spoken, it was easy to see he was either dealing with an antagonist or an aristocrat, and audiences would naturally be rooting for Chaplin, the underdog. The plots were just as simple, setting up blunt contrasts between love and hate, kindness and cruelty, selfishness and self-sacrifice. They appealed to the audience’s most basic emotions, and at their best, the silent films of the studio era had a primal power that was irresistible. 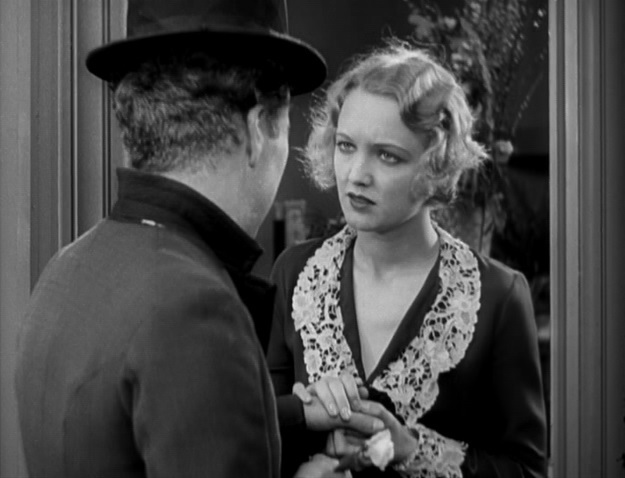 City Lights is one of the prime examples of this kind of filmmaking. The story is real simple. The Tramp falls in love with the Blind Girl who sells flowers on the street. When he finds out she needs money, he (sort of) steals the cash to help her out, but ends up going to prison for the crime. You can’t get much more melodramatic than that, but Chaplin uses this soap opera storyline to create a film that’s funny, beautiful, and sometimes heartbreaking. These days there are lots of people who complain that Chaplin’s work is too sentimental, and even in his own time there were critics who held that view. All I can say is, it works for me. If I thought that he wasn’t sincere, that he was just trying to manipulate the audience, then I’d be angry at this fraud who was tugging at my heartstrings. But I think Chaplin absolutely believed in the world he created on the screen. Not to say that he believed it was realistic, because he certainly knew that his movies relied heavily on artifice. The reality he was reaching for was an emotional one. Even if the situations were sheer fantasy, Chaplin tried to make the emotions ring true. One of the reasons Chaplin was so good at putting us in touch with his characters’ feelings is that he understood the relationship between the performer and the camera. For his comic scenes, he spent endless hours shooting rehearsals so that he could fine tune every gesture, making it fit precisely within the frame. The sequence where we see him gazing at the statue in the store window is a classic example. The whole thing is shot from one angle, but it’s absolutely the right angle. Chaplin shot reel after reel of rehearsals, slowly working out a subtle choreography that can wring laughs out of the smallest gesture. In the scene where he meets the Flower Girl, played by Virginia Cherrill, it starts out sweetly charming, then there’s a sense of wistful longing, and suddenly we’re laughing at a slapstick gag. Chaplin accomplishes all this with the simplest set-ups, but he always makes sure that the camera is positioned to pick up everything the actors are doing. It’s not just the expressions on their faces, it’s the way they stand, the way they walk, the way they move their hands. The storyline may be pure melodrama, but scenes like this are a subtle, complex dance. 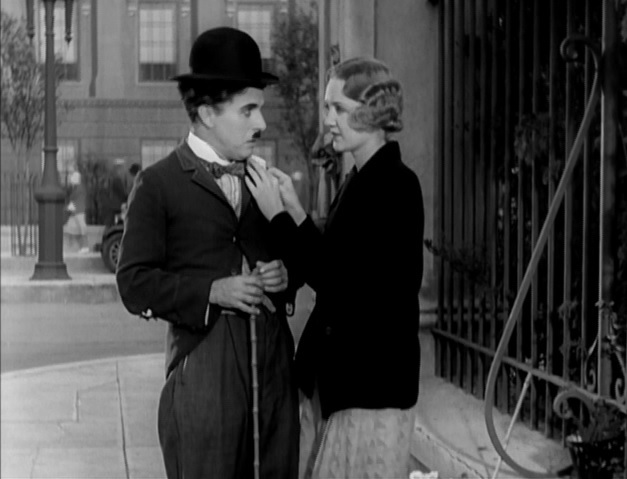 City Lights shows how completely Chaplin understood silent filmmaking, but he never figured out how to deal with sound. His art was built on the poetry of popular melodrama. The images were so simple you didn’t need words. When he finally started making films with dialogue, the words seemed like excess baggage, weighing everything down. He certainly has some interesting things to say in movies like The Great Dictator and Monsieur Verdoux, but in those later efforts it seems like he’s trying to explain himself, rather than trusting us to understand. In City Lights he doesn’t need to explain anything. We don’t have to hear what Chaplin is saying. We can feel it. At the beginning of the twentieth century, Russian culture was a hotbed of innovation. In constant conversation with Europe, Russian painters, writers, musicians and filmmakers were rapidly absorbing new ideas from France, Italy and Germany, and blazing new trails of their own. When the Revolution occurred in 1917, it only seemed to add fuel to the fire. Artists were called on to promote the creation of a new social order, and many of them responded enthusiastically. But there was a shift in direction. Now the ideal was not art for art’s sake, but art that served the people. And so the photographer Alexander Rodchenko began designing posters and packaging. Liubov Popova went from creating paintings to creating textiles. Vladimir Tatlin, known for his abstract constructions, was commissioned to build a monument to the Revolution. 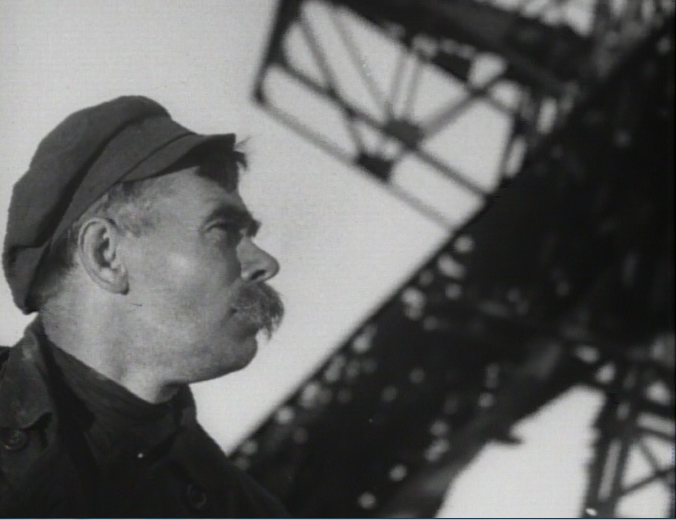 Film was to play a key role in educating people about communist concepts. Since much of the population was illiterate, it was important to communicate the ideals of the Revolution without words, and film had proven its potential as a tool for propaganda. Initially filmmakers were encouraged to experiment, and people like Eisenstein, Vertov and Dovzhenko created visually dazzling features that celebrated the common man. Among this group of innovators was Vsevelod Pudovkin. In 1927, on the tenth anniversary of the Revolution, he directed The End of St. Petersburg to commemorate the overthrow of the Tsar and the transition to a new society. The story is blunt propaganda. It tells us how the simple, honest workers rise up to defeat the soulless, corrupt capitalists. A starving farm boy comes to St. Petersburg looking for work at a factory. Hoping for help, he calls on a friend, but the friend’s wife says she has nothing to offer and turns him away. When a strike is called at the factory, he jumps at the chance for a job without realizing what he’s getting into. Caught in the middle of a chaotic situation, confused as to what’s going on, he fingers one of the strike’s leaders, who is then arrested. Realizing what he’s done, the boy sets out to correct his mistake, but runs up against the evil oppressors and is thrown in jail. In the hands of a lesser director this would be a dreary tract. 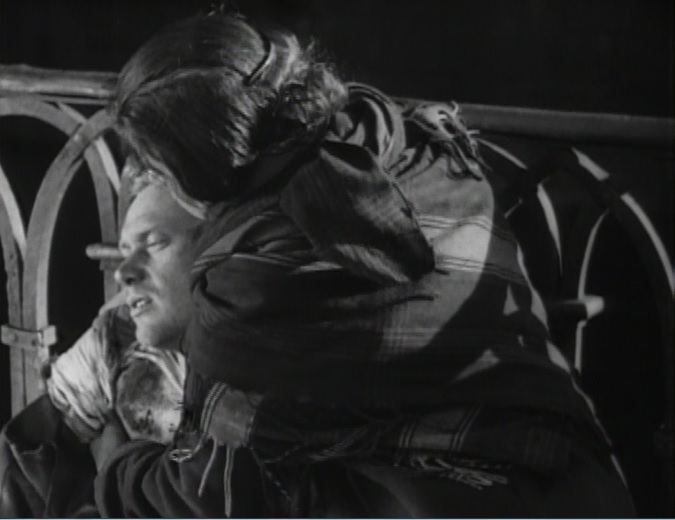 But Pudovkin takes simplistic propaganda and creates an epic canvas populated by mythic characters. And somehow, even though the characters are all archetypes, the director makes them searingly human. Much of this is because of the way Pudovkin handles the actors. In the first place, these are not movie stars. They look like ordinary people. The faces of the peasants on the farm are weathered and worn. It’s not hard to believe they’ve been ploughing these desolate fields for years. When tragedy strikes, the actors don’t dramatize their pain. Instead they confront suffering with a weary stoicism. It’s as though a life of backbreaking labor has robbed them of their emotions. But Pudovkin doesn’t just speak through his actors. He also speaks through images. The film is a blistering visual poem. When we arrive in the city, Pudovkin doesn’t just show us a factory. He creates a montage that assaults us with the terrifying energy and sweltering heat of the Industrial Age. Giant steel wheels spin, vats spill streams of molten metal and chimneys spew vast clouds of black smoke into the sky. The workers are scorched and spattered. They look as though they’ve been pushed to their limits. And so when the factory manager insists that they put in more hours, they refuse. They’ve had enough. Most propaganda films end on a celebratory note. Here the final scenes are muted. The revolutionary forces overthrow the monarchy, but at great cost. After the battle is won, the soldiers who fought to take the Winter Palace are tired and hungry, on the verge of exhaustion. The woman who had turned the boy away earlier comes to the Winter Palace looking for her husband. As she climbs the steps, she comes across the boy, lying on the ground, wounded and weary. Though she sent him away earlier, now she kneels and holds him in her arms. Knowing he must be hungry, she gives him the little food she has left, a handful of potatoes. This simple, caring gesture is more powerful than any revolutionary slogan, any celebration of the workers’ triumph. Pudovkin may have been making propaganda, but ultimately he was more interested in people. This brief period of astounding creativity in Russian cinema was short lived. As Stalin consolidated his power, he exerted more and more control, not just over filmmakers, but also writers, composers and other artists. The idealism that had lifted them to new heights, that had inspired them to make revolutionary art, was crushed. It would be decades before Russian cinema found its voice again. I just got back from seeing Too Much Johnson at LACMA, and I’m not sure if I can describe the way I feel right now. Excited and grateful are two words that come to mind, but that’s just scratching the surface. I feel like I’ve been allowed to look through a window on the past. I feel like I’ve travelled back in time and caught a glimpse of a brash young man who was crazy enough to think he could conquer the world. No doubt my reaction has a lot to do with the tremendous respect I have for Orson Welles. It’s not just that I think he’s a great director. I feel closer to Welles than any other filmmaker. His work literally changed my life. So to have this footage surface out of the blue when everybody thought it was long gone is pretty amazing. It’s important to say at the outset that Too Much Johnson was never intended to be released as a feature. Welles wanted to present William Gillette’s play on the stage, and the production he envisioned included film segments that would introduce each act. He shot four hours of footage and began to edit it, but the play didn’t survive out of town tryouts and the partially completed fragments were never shown. Apparently the reels sat in a warehouse for decades until they were recently rediscovered. The surviving material is over sixty minutes of film that was partially edited by Welles. Of those sixty minutes, only about the first third approaches anything like a coherent narrative. The rest is comprised of disconnected scenes in some kind of sequential order, but remember that this was never meant to be a complete narrative anyway. What we’re seeing are fragments of fragments. In some cases we see multiple takes of a single shot, and at times it’s hard to make any sense of what’s happening onscreen. Many people would probably see this stuff as an incoherent mess. Apparently some audience members who have viewed the footage were disappointed. I guess it depends on what you’re looking for. I was thrilled. Not because it’s up there with Welles’ best work. It’s certainly not. But it’s a glimpse of one of film’s great artists at a time when he was first getting a grip on the medium. And in spite of the incomplete and chaotic nature of what remains, it clearly points toward the work Welles would do when he came to Hollywood. To this day, many people look at Welles’ career and see a failure. They complain that he worked intermittently as a director, couldn’t adjust to the demands of the studio system and left many projects unfinished. No doubt the appearance of one more unfinished film will be seen by many as further evidence of his “lack of discipline”. What rubbish. The idea that somebody who completed thirteen features, often using his own money, could be called undisciplined is ridiculous. Obviously Welles’ critics have absolutely no idea how difficult it is to make a movie, much less how incredibly difficult it is to make a movie on your own terms. These people also ignore the fact that Welles staged several plays, created a small but startling body of work for television, and produced a staggering number of broadcasts for radio. He didn’t finish everything he started. That’s true. Welles had a restless mind and was constantly looking for new challenges. Sometimes he took on more than he could handle and found himself running short of time or money or stamina, and yes, he had his share of colossal failures. So what. I’m way more interested in somebody who shoots for the moon and fails than I am in somebody who plays it safe and “succeeds”. Welles liked to take chances. He liked to test the boundaries. He liked to experiment. Too Much Johnson is an experiment. Watching the footage it was as though I could feel Welles’ excitement in discovering film. In the early scenes especially I got the sense that Welles was playing with the medium, trying to see how far he could go. A couple of the people who spoke at the screening I attended said that Welles was trying to recreate the look of the films made between nineteen ten and nineteen twelve. I couldn’t disagree more. In movies from that period scenes were almost invariably shot from a single angle, usually frontal, and cutting within a scene was rare. Close-ups were almost non-existent. Too Much Johnson, on the other hand, is strikingly dynamic. Welles’ forceful compositions anticipate Citizen Kane, and the only silent film directors you’ll find who take the same liberties in framing a shot are the guys who made avant-garde shorts in Europe during the twenties. Even before he got to Hollywood, Welles already had a strong visual sense. He was always looking for ways to create space. And in the sequences that are most fully shaped, there is a good deal of cutting, some of it so bold and so rapid that you might compare it to Eisenstein. Apparently Welles watched a lot of silent comedy to prepare for shooting, and no doubt Mack Sennett was an inspiration. But the complexity of the best gags and the imaginative imagery are way beyond the crude, knockabout antics of the Keystone Cops. Too Much Johnson is closer to the inspired surrealism of the films Buster Keaton made in the twenties. Seeing Too Much Johnson is a reminder of how much Welles loved comedy. Because our view of him today is based mostly on the features he made, I think that’s an aspect of his work that tends to be forgotten. While most of his films have comic moments, the context is often so dark that I rarely laugh out loud. But look at the plays he staged on Broadway, like Horse Eats Hat and Shoemaker’s Holiday. Listen to his radio adaptations of Life with Father and Around the World in 80 Days, or the variety shows he did in the forties. Check out The Fountain of Youth, a witty and inventive TV pilot he made in the fifties. Welles loved a good laugh, and Too Much Johnson reminds us that he spent a lot of time trying to make audiences laugh, too. I think one of the reasons that Welles left a number of projects unfinished is that he expected a lot of himself. When you look at the time he invested in preparing his films, the energy he expended in shooting his films, and then the obsessive care that he took in editing his films, it’s clear that he had extremely high standards. Those of us who value his work can’t help but feel frustrated that we never got to see Don Quixote or The Deep. But my feeling is that he didn’t finish them because he wasn’t satisfied with them. In his mind, they weren’t good enough. If that’s true, he’s probably rolling over in his grave now that this footage from Too Much Johnson has been discovered. It’s rough, it’s raw, it’s messy. But for those of us who love Welles, it’s a reminder of how talented, how daring, how creative the guy was. It’s exhilarating to see the way he threw himself into shooting this footage, back when it probably seemed like anything was possible. Back when he was still a brash young man who was crazy enough to think he could conquer the world. There were many people involved in bringing Too Much Johnson to the screen. One of the most important players was the National Film Preservation Foundation. They’ve been responsible for the rescue and restoration of many movies thought to be lost, and if you care about film history, you might want to think about making a contribution. Just click on the link below. In nineteen twenty seven, Berlin was a city suspended between two wars. Germany had been devastated by the violent conflict which had ended less than a decade before. It was a country still trying to rebuild itself, with mixed success. The capitol was in a dizzying state of flux. The government was fragile, the economy was unstable, but the culture was flourishing. The chaos seemed to inspire artists, writers and composers to break away from the past and imagine a new future. Nowhere was this newfound freedom more apparent than in German cinema. Writers, directors and designers explored radical new approaches to making movies, and the films they made attracted a good deal of attention both in Europe and abroad. One of the most original talents to emerge during this period was Walther Ruttman. Ruttman had worked as an artist and an architect before beginning his film career in the early twenties. He began making abstract animated shorts using form and color to create a kind of visual music. Berlin: Die Sinfonie der Großstadt uses images of a vast metropolis to create a different kind of visual music. It is not a documentary, but an attempt to distill the spirit of this great capitol in a cinematic tone poem. Ruttman didn’t want to tell a story. He wanted to compose music with images. In this film he creates a visual symphony that incorporates the frenzied energy, the languorous calm, the lights, the shadows, the madness, the excitement of a great city. In the same way that a symphony is divided into movements, the film is divided into five parts, or “acts”. We observe the life of the capitol through the course of a day, starting at dawn and ending at midnight, with each of the five parts focussing on different aspects of this sprawling urban giant. And just as a piece of music has various themes that recur throughout, there are visual motifs that are used repeatedly, binding the torrent of images together. The opening sequence is a perfect example of the film’s musical structure. Ruttman begins with images of water, rippling gently. This segues to an animated sequence, where horizontal lines are crossed by diagonal lines falling against each other in a rhythm that builds slowly. And then we’re at a railroad crossing as barriers fall into place across the tracks. Suddenly a train is hurtling across the screen, and soon we’re experiencing the motion of the train as it rushes through space, trees flashing by so quickly they become abstract shadows flying past in a blur. After tearing through the countryside, speeding past the slums on the outskirts, the train gradually slows, the rhythm gradually slows, as we enter the city. 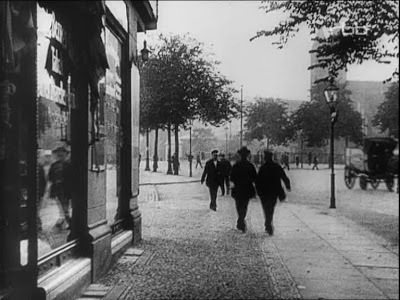 From this powerful opening, the film goes on to show us a panorama of life in Berlin during the twenties. We see children stroll through the streets on their way to school and workers march through the gates at massive factories. We see the wealthy consuming their banquets with relish and the poor begging for scraps on the street. Machines play a central role in the film, spinning, stamping, steaming, smoking. At times the action is fast-paced and frenetic, pulling us into the aggressive rhythm of the city. But the director also shows us that there are quiet moments, spaces for relaxation and leisure. Throughout the film Ruttman focusses on the crowd rather than on individuals. He seems to be standing back, trying to act as a neutral observer, but at times he does comment on the images. Scenes of crowds milling through the streets on their way to work are juxtaposed with a herd of cattle making their way down a road. A frenzied montage of men in the business world is matched with footage of dogs fighting. And there are moments when Ruttman pushes the film into abstraction. Typewriter keys melt into a geometric swirl of letters. Pinwheels fill the screen, spinning relentlessly. Words come rising rhythmically off pages of newsprint. The images are half of the film. The other half is the score. Sadly, the music originally written for Berlin by Edmund Meisel has apparently been lost. But the version of the film that I’ve seen, which was released by Kino Video in the nineties, has a newly composed score by Timothy Brock which is beautifully suited to Ruttman’s cinematic tour de force. With a movie like this, the composer isn’t just writing individual cues as needed. Brock’s score for Berlin is a complete work. He must have spent a lot of time with the film, getting to know it intimately before he started, because his music is perfectly matched to the images on the screen. The driving motion of machines is accompanied by a furious string section playing overlapping rhythmic figures. A lull in the early afternoon is scored with lyrical winds and reeds. And to underline the frightening intensity of this massive city, the composer rolls out thundering percussion as needed. Brock’s score gives this film everything it needs. He nails it. Berlin: Die Sinfonie der Großstadt is a thrilling, visionary film. I’m so blown away by what Ruttman accomplished that I’d like to hold him up as a hero. But I can’t. As I said earlier, at the time this film was made, Germany was between two wars. The country’s faltering economy finally collapsed, driving a desperate nation to desperate solutions. By the early thirties the German people were embracing Adolph Hitler as their leader. While many German filmmakers fled the madness, Ruttman stayed behind and worked for the Nazis, making propaganda films. 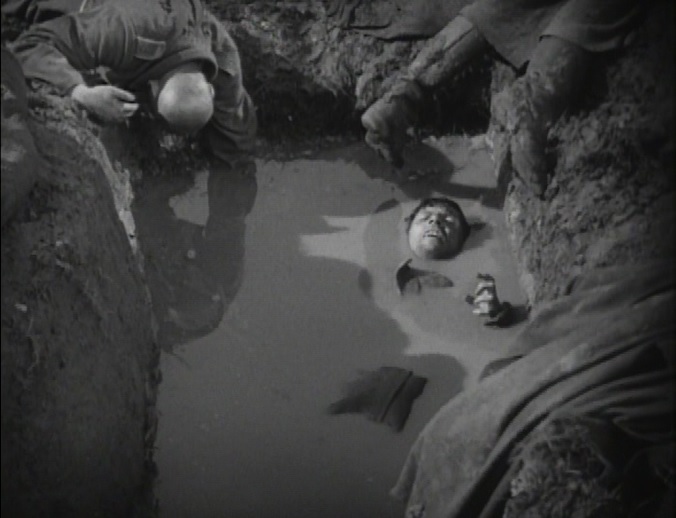 In nineteen forty one he was injured while filming at the Russian front, and died shortly after. It’s baffling to see an artist with so much talent and so much imagination embrace the horror of Nazism. How could someone so intelligent embrace a philosophy that worshipped violence and death? As I’ve grown older, I’ve become more and more aware of the disturbing fact that there are people who have tremendous gifts who also do truly monstrous things. I don’t understand it. I don’t think I ever will. But just as I can’t embrace Ruttman as a hero, I can’t dismiss his work. Berlin is an exhilarating panorama of a modern metropolis in all its terrifying wonder. A silent film that uses the power of images to reach across time and space to show us a place, a people, that have long since vanished. And also a work of art that, if we look closely, might remind us of who we really are. The great screen comedians need to create a world of their own. In their best films, Buster Keaton, Charlie Chaplin, W. C. Fields and others inhabited a universe that was governed by their own set of rules. I think this is one of the reasons comedians have such a hard time sustaining their careers. They tend to choose projects where they get to do funny things, instead of choosing projects that will allow them to be themselves. Woody Allen has been more successful than many, I think in large part because he writes and directs his own movies. Steve Martin can be brilliant, but his films are often crippled by directors who seem more focussed on framing the action than creating a world where the star can be his eccentric, outrageous self. Richard Pryor is one of the greatest comics this country has ever seen, but aside from his concert documentaries, he generally ended up in movies where the makers seemed to have no idea what to do with him. For a time, Buster Keaton managed to create a world on film that was his alone. While his movies usually have a love interest, and there’s always an assortment of supporting characters, Keaton is the only one who truly has a presence. The rest are two-dimensional figures drawn with a few bold strokes, staying on screen just long enough to fulfill their purpose. 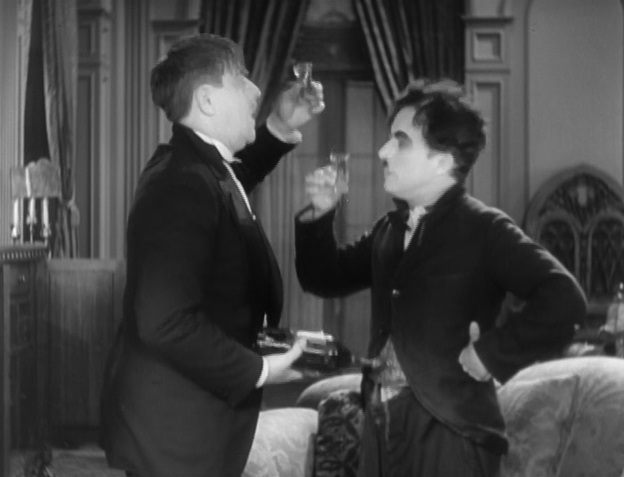 In a Chaplin film the supporting players often have a life of their own. We might recognize them as people we’d meet on the street, and sometimes they have surprising emotional depth. The laughs in Laurel and Hardy’s silent films come out of their absolute inability to cope with everyday situations. They just aren’t equipped to deal with the real world. But Keaton’s films have little to do with the real world. They take place entirely in his imagination. Cops starts off with Keaton’s girlfriend telling him to get lost. He’s not successful enough, and she doesn’t want to marry a loser. In the very next scene, Keaton finds a wallet full of money. It’s actually not quite that simple, but it would be impossible to describe the high-speed, knockabout ballet that ends with our hero making his getaway with a wad of cash. Now having the necessary capital to invest, our hero runs across a man sitting on the curb next to a mountain of furniture. The man says he’s just been evicted, and has to sell his belongings. Keaton, trying to act like a real businessman, makes the purchase, thinking he can sell everything for a tidy profit. Naturally this would impress his girlfriend. Unfortunately, the man on the curb doesn’t tell him that the furniture is not his. It actually belongs to a family that’s getting ready to move. They’ve put everything they own out on the sidewalk to have it ready for the expressman. Soon Keaton is driving a horse-drawn wagon, the back piled high with furniture. The magical series of misunderstandings leading up to this is completely absurd, but in the context of the movie it all seems to make perfect sense. After a fairly prosaic beginning, this tight little two-reel film is rapidly moving into the realm of surrealism. A boxing glove is transformed into a turn indicator, which works well until a policeman is decked. Keaton decides it’s easier to communicate with his horse by calling him on the phone. One minutes he’s driving down an empty street, the next minute he’s in the middle of a parade, doffing his hat to the cheering crowd. As if all this weren’t enough, out of nowhere an anarchist tosses a bomb, and all hell breaks loose. Of course, Keaton gets the blame for it all. He has gone from being a rising entrepreneur, calmly driving his cart down the road, to being public enemy number one, now fleeing from an army of cops. And it gets worse. Completely in keeping with the film’s absurd logic, it turns out that the head of the household that lost all its furniture is a policeman. And to take it even further, the father of the girl he’s trying to impress is the chief of police. 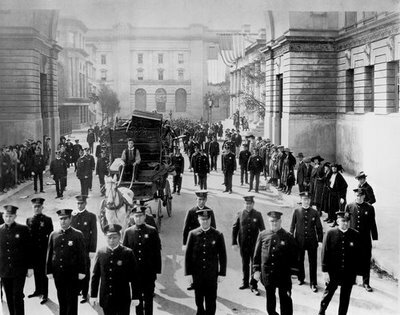 Soon Keaton is dashing madly down the city’s streets, pursued by a horde of cops that seems to keep growing larger and larger. In the hands of a less talented man, this might seem like overkill. In the world that Keaton has created, it seems like the only possible outcome. Years later, Edgar Ulmer directed Detour, a noir classic which tells us in the starkest terms imaginable that there’s no point in running. We can’t escape our fate. Cops basically has the same premise, but in this case it’s played for laughs. It’s not surprising Samuel Beckett was such a big fan of Keaton’s work. If you’d like to take a look at Cops, here are a couple of links you can follow…. The reason I’m giving two links is not because the prints offer different versions of Cops. It’s the music. The first one was scored with a small chamber ensemble for a contemporary release of the film. The second one is scored with a large pipe organ, which is much more in keeping with what you would’ve heard in a theatre back in the twenties. I have to say I’m not totally happy with either version. While the chamber score is certainly a nice piece of music, it doesn’t capture the spirit of Keaton’s world. The music is too genteel for this rough and tumble comedy. The organ soundtrack, while probably close to the accompaniment Cops would have had in the silent days, is too big and too busy for my taste. It doesn’t give the film room to breathe, and doesn’t capture the subtlety that was so much a part of Keaton’s genius. I’d prefer something in between the two. Actually, I remember a night years ago when the Silent Movie Theatre was still actually showing silent movies. They had a Keaton night, and I’m pretty sure Cops was on the bill. At any rate, to accompany the films they had a guy on piano, and I thought he really nailed it. He knew how to complement the action on the screen without competing with it, and he had a light touch where it was needed. I was so impressed with his playing, I went up to him during intermission and asked him his name. Of course, that was years ago, and now I’ve totally forgotten it. These days the name D. W. Griffith is not widely known. For most of the people who are aware of him, he has become one of those figures whose life is defined by a single act. Birth of a Nation is notorious, and rightly so, for its horrifying racism, and that one film has come to define Griffith’s image in the public arena. Because of the director’s reputation as a racist, and because the audience for silent films has shrunk to almost nothing, there’s little awareness of his importance as a filmmaker, his stature as an artist and his place in American history. If somebody tells me they don’t want to watch Griffith’s films because of the racist attitudes they promote, I can understand that. But if somebody who cares about film says they don’t want to watch Griffith, it’s comparable to an English lit major saying they don’t want to read Shakespeare. They both occupy a similar place in their respective realms. Like Shakespeare’s plays, Griffith’s films do contain ugly racist propaganda, and like Shakespeare’s plays, Griffith’s films also speak powerfully of compassion, forgiveness and justice. How do we reconcile these competing tendencies, whether we’re talking about Griffith or Shakespeare? The answer is we can’t. Both were great artists. Both allowed prejudice to mar their work. And both men were a product of their time, just as we are a product of ours. If people want to cross Griffith off their list for the way he portrayed African-Americans, that’s their right. That does, however, mean ignoring one of the greatest artists ever to work in film, and a central player in twentieth century American culture. It’s probably impossible to understand the development of American cinema (and maybe world cinema) without looking at the director’s work. Also, while Griffith’s films contain many insulting portrayals of Blacks, his attitude toward other groups could be surprisingly progressive. He made a number of shorts dealing with the violence inflicted on Native Americans by Anglos. Broken Blossoms may seem dated now in its portrayal of chaste love between an Asian man and an Anglo woman, but it was extremely daring for its time. And social justice was a major theme in his films, where he often showed the rich and powerful exploiting the poor and helpless. Corner in Wheat is a prime example of his concern for those who struggled just to put food on the table. The film is under fourteen minutes long, but Griffith manages to pack a lot into this one-reel drama. Most of the movies made in the first decade of the twentieth century feature straightforward narratives laid out with blunt simplicity, and you could pretty much count on a happy ending. Not so with Corner in Wheat. Griffith attempts a multi-layered approach to telling the story. We have the poor family living on a farm, the ruthless businessman on the commodities exchange, and the market where people come to buy bread. There is no direct connection between any of these elements. The characters in these three scenes don’t interact, they’re just different aspects of the same system. I don’t know of another film from the period that shows a cross section of society in this way. Most filmmakers of the time used the camera to record the action and connect the scenes so that the audience could follow the story easily. But even in this early effort Griffith was moving away from a strict narrative approach, and beginning to use images as poetry. 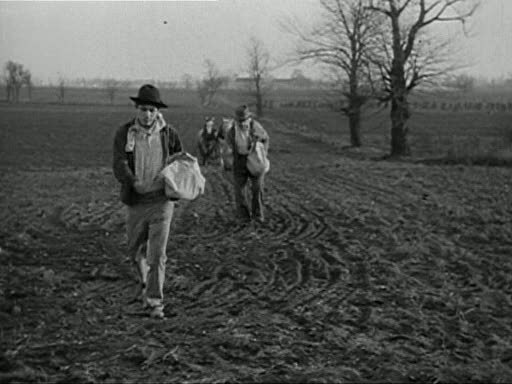 To start with, the film is bookended by scenes of a farmer and his family. We first see the farmer sticking his hand into a bag of seed, letting it run through his fingers. His wife and daughter look on with stoic faces. Then the farmer and an older man (his father?) go into the fields to sow the wheat, scattering seeds as they move back and forth across the empty plain. Cut to the businessman who plans to corner the market in wheat. Wound tight with ambition and impatience, he gives instructions to his traders. Next we see them on the floor of the exchange, where the entire crowd is caught up in a mounting frenzy of elation and desperation. The businessman’s plan works, he corners the market and makes a fortune. At a lavish party attended by society’s elite, everyone raises their glass to toast his success. But then Griffith shows us the impact this has on the common folk. A store that sells bread must raise its prices to cover the high cost of flour. Some can pay, but some can’t. The hungry poor invade the shop demanding bread. The police are called, first using batons to force the crowd back, and then pulling their guns. Griffith tells his story with simple but powerful contrasts like these, and his images have a potency you won’t find in other films from the time. We see the affluent society crowd enjoying their party without a care in the world. We see the farmer holding out his empty hands to let his wife know that they have no money. And we see the businessman, having fallen inside a grain elevator, struggling for life as the wheat comes pouring down on him, until only his writhing hand is visible. 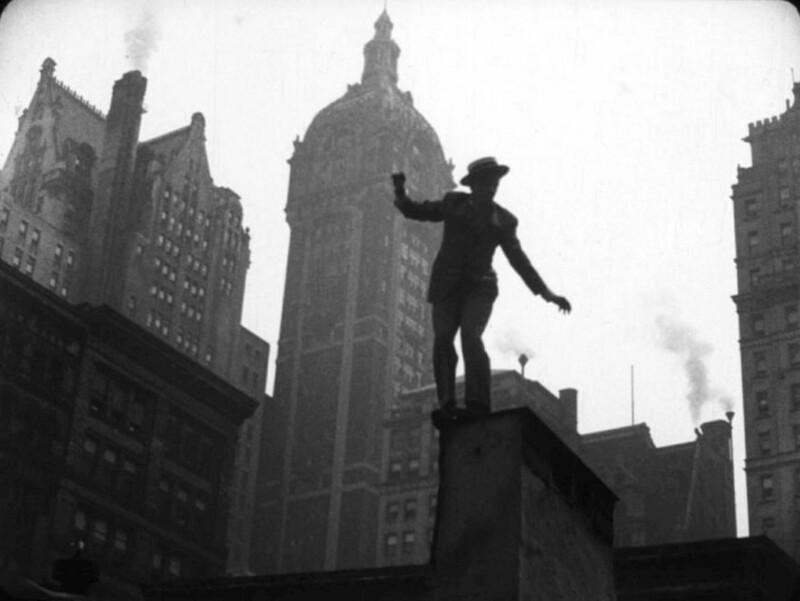 And the film’s final image sums up the bitter despair brought on by the businessman’s scheme. We see the farmer again sowing seed, now by himself on the lonely plain. Going down one row he nears the camera, then he turns, walks back in the opposite direction, and the image fades from the screen. Corner in Wheat is one of many shorts that Griffith made for Biograph between nineteen eight and nineteen fourteen. During this time the director was constantly experimenting, constantly testing the boundaries of the new medium. These one and two reel movies show him searching for new ways to use the language of film, and the techniques he developed at Biograph would form the basis for his later features. Eventually Griffith’s work would change cinema forever. Corner in Wheat is one of his first steps along that path. Watch the film by clicking on the title below.